According to the manufacturer the Riga Onion series greenhouse is the absolute sturdiest hobby greenhouse available. We didn't have the advantage of being able to test in the extreme high winds that Riga has tested, but we certainly could find no reason to dispute their claims. 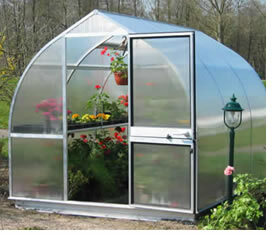 If the Riga is anything it is a sturdy and durable greenhouse. One of the biggest reasons for the Riga's extremely high wind and snow resistance is the most obvious - it's "onion" shape. As the picture shows, the Riga's are rounded on the sides coming to a point on top, which helps shed snow and lessens the effect of high winds. While this is a good feature to have from a strength standpoint, we were not as thrilled about the shape from an aesthetic standpoint. While the manufacturer states the onion shape is "beautiful", our unscientific poll of our review team was much more partial to the more traditional shapes of the Rion's and Juliana's. That's not to say the Riga's are ugly, we just as a whole preferred the looks of the other models we tested. The size options for the Riga's are varied and, much like the Rion Hobby Gardeners and Prestiges, give a great range of lengths from fairly small to very large. They range from length of approximately 7' up to 17', and also have two width options of 7' or 9'. This means that just about any gardener can find a just right for them size. The heights of the Riga vary depending on the model from 7' to 7'6". Similar to the Juliana Premium, this is nice while you are standing in the middle of the greenhouse, but again we noted that we had to do more stooping inside the greenhouse than in the Rion Hobby Gardeners or Prestiges because of the way the roof slopes more severely from top to sides. If you are a taller than average gardener and work inside the greenhouse much, this can be a noticeable drawback to the Riga's and the Juliana Premium. As for shipping, we hate to keep beating the same drum, but the Riga Onion's are similar to the Juliana Premiums as they are also shipped via LTL Freight. In case you didn't read the reviews on the Rion Hobby Gardeners and Prestiges, basically LTL Freight means the greenhouse is shipped on a flatbed truck instead of via a common carrier like UPS or Fedex. The reason for this is that the package size and/or weight is too much for common carriers. Similar to the Rions, the Riga has an optional base kit that can be used to secure the greenhouse to the ground. As with the Rions we would definitely recommend purchasing the base, although in this case you will be shelling out around $100 more for any of the Riga base kits than you would for comparable sized Rion base kits. As for standard features, the Riga's come with roof windows, automatic roof window openers, and a hinged rear window. You can also purchase some shelving units that attach either at a standard shelf height (about hip level), or upper unit shelves that are more at eye level. We did like these shelving units and thought they were functional and attractive, although a bit on the pricey side.